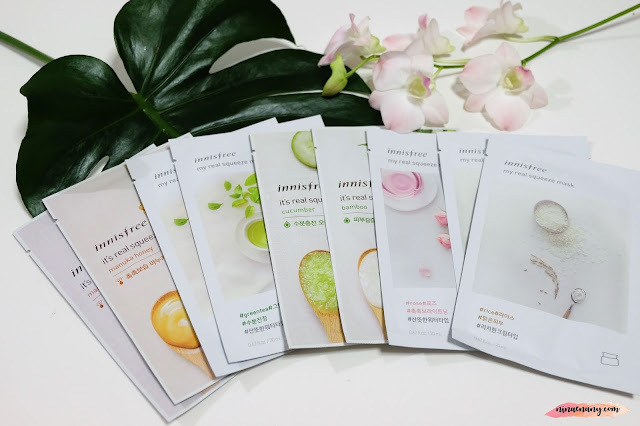 Another review about the sheet mask of the Innisfree My Real Squeeze Masks (20 ml) and this kind of sheet mask has 17 variety types. But I only try a few of the My Real Squeeze Mask, which are Manuka Honey, Green Tea, Cucumber, Bamboo, Rose, and Rice. The normal price is RM 4.50 each. My Real Squeeze Mask [Oatmeal] – this rich-cream type mask is enriched with nutrient-rich oatmeal, leaves rough, dry skin moisturized and smooth. My Real Squeeze Mask [Ginseng] – this rich-cream type mask is enriched with abundant nourishment from slightly bitter ginseng, bring vitality and energy to the tired skin to leave it moisturized and healthy. My Real Squeeze Mask [Fig] – this moisturizing-essence type mask is enriched with rich vitamin thoroughly squeezed from figs, leaves dull skin smooth and clear. My Real Squeeze Mask [Tomato] – this moisturizing-essence type mask is enriched with abundant nourishment from well-ripened tomatoes, leaves tired skin clear and vibrant. My Real Squeeze Mask [Broccoli] – this refreshing-water type mask is enriched with rich vitamins from broccoli, for a clear and supple skin. My Real Squeeze Mask [Rice] – this rich-cream type mask is enriched with abundant nourishment from rice, leave dull skin clear and transparent. My Real Squeeze Mask [Acai Berry] – this rich-cream type mask is enriched with the abundant nourishment of thoroughly squeezed acai berries, leaves the skin resilient and full of energy. My Real Squeeze Mask [Rose] – this refreshing-water type mask is enriched with moisture from fragrant roses, leaves the skin smooth and radiant. My Real Squeeze Mask [Lime] – this refreshing-water type mask is enriched with moisture from fresh lime, leaves the skin bright and transparent. My Real Squeeze Mask [Tea Tree] – this refreshing-water type mask is enriched with refreshing tea tree, leaves the skin clean and clear. My Real Squeeze Mask [Pomegranate] – this moisturizing-essence type mask is enriched with juicy pomegranates, leaves this skin plumps and radiant. My Real Squeeze Mask [Shea Butter] – this rich-cream type mask is enriched with moisturizing shea butter, deeply moisturizes dry and tight skin. My Real Squeeze Mask [Manuka Honey] – this moisturizing-essence type mask is enriched with nourishing manuka honey, thoroughly replenishes moisture on dry, rough skin. My Real Squeeze Mask [Aloe] – this moisturizing-essence type mask is enriched with moisture-rich aloe, protects tired skin against external stimulants and helps to soothe and calm the skin. My Real Squeeze Mask [Bamboo] – this refreshing-water type mask is enriched with the abundant moisture of vitalizing bamboo, helps to moisturize dry skin. My Real Squeeze Mask [Cucumber] – this moisturizing-essence type mask is enriched with fresh moisture from fragrant cucumbers, replenishes moisture on the dry skin. Honestly, I use this sheet mask in 1 to 2 times in weeks during I do the 10-steps of night routine but it depends on my skin concerns too. This kind of sheet mask gives my skin moisture. After I remove the sheet mask around 15 – 20 minutes, I do dab the remaining ingredients on my skin but its make my skin a little bit oily after a few hours and normally I will wipe it a little bit. Since my skin type is combination and oily so I hate the oily feeling on my skin. I will try to reduce is as much as I can. Most of this sheet masks, I got as a free gift when I bought the k-beauty in South Korea because of that some of the packages is different. I would like to give the 3 stars out of 5 stars to this product.